Rocky Fordyce strode slowly but steadily with the help of a walker from the back of the boardroom at Old Cambria Grammar School to be honored along with a handful of other retirees from Coast Unified School District. “He loved the kids … he always put them first,” district business manager Annie La Chance said as she outlined his 35 years of service. 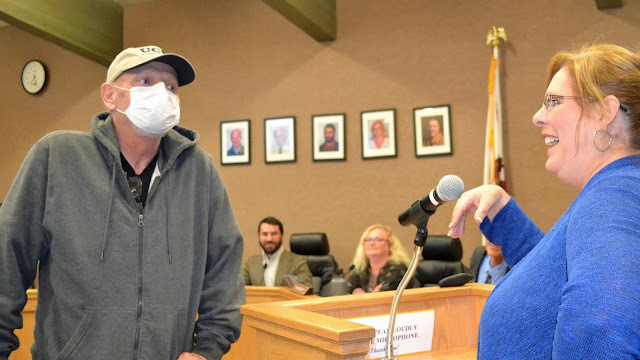 That Fordyce was alive, let alone able to stand tall as he received his accolades, was a testament, he and friends said, to his dogged determination to survive, medical advances and the strength of bonds formed in small-town Cambria. It was just months prior when Fordyce on New Year’s Day received a double-lung transplant. That’s when “Team Rocky,” a group of school buddies, co-workers and friends bonded together to do the intensive caregiving that the bachelor patient needed to survive and thrive.